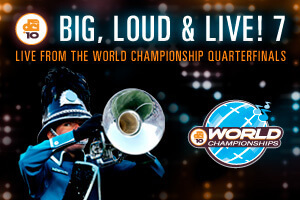 Celebrate the best of the best as Drum Corps International presents its 2010 World Championship Quarterfinals LIVE on the big screen! Presented by DCI and National Cinemedia's Fathom Events, Big, Loud & Live 7, will be simulcast from Indianapolis' Lucas Oil Stadium into nearly 500 movie theaters nationwide on Thursday, August 12 at 6:30 p.m. ET. ORDER YOUR TICKETS BEFORE ANYONE ELSE! DCI fans have the exclusive opportunity to purchase their tickets to the Big, Loud & Live event before they go on sale to the general public this Friday! Ffind a theater near you and purchase your tickets today.